Performance measurement; Cooperation and collaboration; The Pareto rule and the problems of user satisfaction; Impact and cost evaluation; Information and uncertainty; Forecasting and simulation; Conclusion. 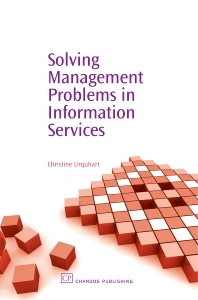 The book provides a practical approach to solving management problems in information and library services. The aim is to demonstrate that some simple mathematical techniques can be used to make the life of the harassed manager easier and more interesting. Dr Christine Urquhart is a Senior Lecturer in the Department of Information Studies, University of Wales Aberystwyth. She leads postgraduate research training programmes in the Department. Her research interests concern information behaviour and health information management research. She has worked for the Department since 1993, and prior to that worked in a variety of information and library posts.